Choosing a school for your child’s education is one of the most important decisions you make. It’s critical that the school you choose is the right “fit” for your child and family. Before considering any school for your child, it is important that you first take inventory of your child’s needs and your expectations of a school. Then, when you are visiting a school and talking to the Director of Admissions and Enrollment or teaching faculty, you know what to look for and focus on relative to your family’s needs. Many parents choose a Montessori school without fully understanding the educational philosophy behind it. 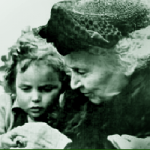 Dr. Maria Montessori, the Italian physician, created the Montessori system of education in 1907 based on her research and experience with young children who were not considered “acceptable” in conventional schools. Her “follow the child” philosophy is often misinterpreted to mean that children are allowed to do whatever they want in a classroom. In fact, children are allowed freedom within limits to develop to their full potential, guided by Montessori-trained teachers. A classroom has specific Montessori materials and lessons in the areas of language arts, mathematics, practical life, and cultural studies is called the “prepared environment”. It is a key facet of the Montessori philosophy referring to the physical, instructional, and spiritual aspects of the classroom. Spiritual, in this sense, is a secular reference to peace of mind, enabling the teacher and student to engage in learning in a calm environment and manner. Not all Montessori schools are alike. For example, some may articulate their programs differently from one another based on the needs of the families and community they serve. However, there are some basic Montessori principles to look for when considering a Montessori school for your child. Montessori classrooms are typically structured in three year age groups, based on what Dr. Montessori called the “planes of development”. Younger children learn through observation of older children while older children gain the experience of role-modeling. Look for classrooms that have mixed-ages and that they are engaged in learning together. At Country Montessori School, three programs of mixed-aged learning are offered; 3-6 year olds in Early Education (Preschool and Kindergarten), 6-9 in Lower Elementary and 9-11 in Upper Elementary. Montessori teachers must complete a rigorous training program to earn their Montessori teaching credential. The American Montessori Society (AMS) and American Montessori Internationale (AMI) are two official Montessori regulating organizations in the United States, ensuring the training centers under their purview meet strict guidelines for Montessori teacher and administration training and credentialing. All teachers at Country Montessori School are AMS, AMI, or NCME-credentialed for the levels/grades they teach and/or are enrolled in an AMS training program and are being mentored by an experienced teacher. CMS has a strong staff development program and history of “growing our own” for employees to earn their Montessori credential. Dr. Montessori created specific learning materials and lessons to enable children to progress from the concrete to the abstract. Learning takes place through the senses. Many of the materials are self-correcting and enable the child to check himself. There are specific materials for Montessori lessons in language arts, mathematics, practical life, and cultural subjects. Country Montessori School has made investment in high-quality Montessori materials a priority for each of our programs and classrooms. And as such, we have a full complement of Montessori materials as well as additional teacher made and supplemental materials. Montessori classrooms are designed to be child-centered with child-sized tables and chairs and easy access to Montessori materials. The Montessori classroom is neat and orderly with clearly defined areas for the language arts, mathematics, practical life, and cultural subjects. The prepared Montessori classroom is calm and peaceful. Children are engaged in lessons one-on-one with a teacher or with a small group. They may also be working alone, mastering a skill or lesson or in observation of another child. Times for silence are practiced at all levels. The American Montessori Society (AMS) and the American Montessori Internationale (AMI) are the standards bodies charged with maintaining the quality and integrity of Montessori practice. Country Montessori School is a full member school of AMS. Our school follows the above Montessori principles and has regular visits and reviews by AMS members for professional and program reviews and consultations. Our mission at Country Montessori School is to provide children an authentic Montessori education, focusing on their emotional, social, spiritual, and academic development. The foundation for our program is achieved through the above-listed Montessori principles and strengthened by the passion and dedication of our community of teachers, administrative staff, Board of Directors, and families.